June 24, 2010 — Last year I started a simple tradition: to take my birthday off from work and try to have some sort of adventure. Last year, I used the day to build a small trebuchet. 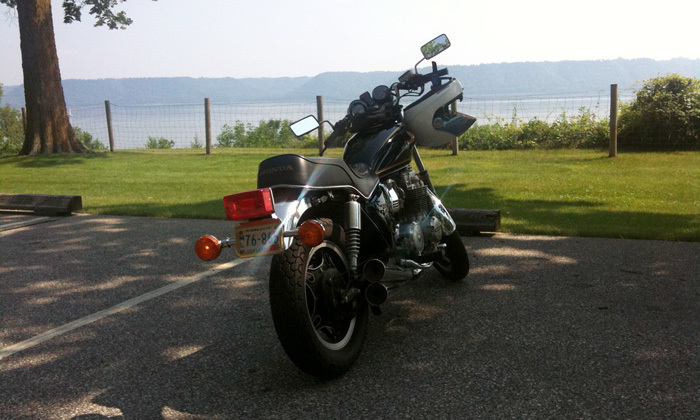 This year, I took my first ever motorcycle day trip on my 1980 Honda CB650. At just 140 miles round trip, my ride wasn’t more than an afternoon’s jaunt, but what I experienced in that afternoon has cemented motorcycle riding into my life in a really profound way. But before I could take off into the windy hill roads of Wisconsin, I had work to do. Any bike trip requires preparation. In order to make this day’s journey happen, I had some wrench work to do on the motorcycle. Hanzo needed an oil change, a double-check on the carburetor synchronization, and a rebuild of the master cylinder for the front brake. On Monday, I changed the oil and filter and simply couldn’t believe the difference it made in how the bike runs. On most motorcycles, the engine oil also lubricates the transmission and the clutch. So when the oil is old and sketchy, it’s not just the engine that suffers. New lube in my CB650 completely transformed the bike. The transmission was less notchy, the clutch was lighter, and the engine pulled harder and smoother than ever. The nagging hesitation I’d feel in the engine when quickly screwing on the throttle disappeared completely. Best of all, the exhaust note got just a touch sweeter. Four cylinders on those four pipes makes the CB650 howl like an old italian super car — a real aural delight. Now for the brake. If you stop to think about hydraulics, the physics involved are just amazing. That a little 1/2″ diameter steel piston can bring more than a quarter ton of bike and rider to a stop on just the squeeze force of my fingers is downright incredible. Rebuilding the master cylinder for the front brake involved basically just pulling the guts — the piston, springs and seals — out of the assembly and replacing them with new ones. The thing that made this particular rebuild tricky was the fact that it was encrusted with nasty old brake fluid residue. More specifically, getting the snap ring off the handle end of the piston took longer than the whole rest of the job. The biggest lesson learned for me was that money spent on good tools is never wasted. After breaking a set of cheap snap ring pliers, I had to pony up the extra $10 for a real tool. Then I had a bit of Mythbusters-style fun creating longer “fingers” for the pliers. I took some 1/8″ piano wire, ground the points down for snap ring use, then torched the springy steel a few times and dunked them in old motor oil to harden them. It worked like a charm! Unfortunately, all the tool wrangling had cost me a day. Thursday was coming and I couldn’t ride without a front brake. Now that I was able to get to the internals, I was pretty horrified to find that not only was the brake fluid black as ink (new fluid is nearly clear — like corn syrup), but every interior surface of the mechanism was completely encrusted in burnt fluid and disintegrated rubber. If you’d handed me this thing and told me you found it on the bottom of the ocean, I would have believed you. Lots of scrubbing, scraping and washing out later, the cylinder and reservoir were ready for new components. I rinsed everything out with rubbing alcohol to evacuate any remaining water. Then after that dried out for a minute, I lubed up all the components with fresh brake fluid for reassembly. Wednesday arrived and once office hours came and went, it was time to bleed the system. Using just some silicone tubing and an old butter dish, I was able to get all the air out of the system in about 20 minutes. Not bad at all for my first brake bleed. A quick test ride confirmed that not only did I have brakes, I had better brakes! Score. My trip was on! Thursday morning came and I had three things on the agenda. 1) Eat good food. 2) Clean out my shop, The Lab of Doom. 3) Ride to Maiden Rock Winery and back. With breakfast conjured and consumed (egg biscuit sandwiches for the win! ), I pulled all four bikes out of my garage shop so that I could do some much needed cleaning. The previous month of wrench work and prototyping had tools and debris everywhere. I spent the next couple hours putting tools away, gathering up trash, and vacuuming up dirt and sawdust with great satisfaction. With the Lab of Doom sorted, I had one last piece of wrench work to do before I could head off for the enchanted lands of cheese and bratwurst. There was a bit of stumble left in the CB650’s idle, so I wanted to double-check my carb synchronization. Being old hat with the proceedure by now, I was able to get everything hooked up quickly and sure enough, the #3 cylinder was way off from the others. A few wrench turns later and the motor was butter smooth again. Hopefully this time it’ll stick. Roaring down Hwy 55 toward Hastings, MN I quickly realized that this trip would be a lot more enjoyable if I had some earplugs in. A quick pitstop at Walgreens made for much happier riding. That first stretch of Hwy 55 was the first time I’d ridden that fast for that long. At just under 6,000 rpm, the Honda handled 65 mph with no trouble at all. Vibration was minimal and even without a windscreen the wind in my chest was present but not unpleasant. This was it. This was motorbiking for journey’s sake. I ate up the miles and was in Hastings before I knew it. Turning north on Hwy 61, I made my way through Hastings and intersected Hwy 10 toward Wisconsin. This road eventually merges with Hwy 35 on the Wisconsin side — The Great River Road, they call it. Well they’re not kidding. It’s a magnificent piece of highway. Mostly two lane, mostly 55 mph speed limits, sweeping turns, lots of elevation changes, and more often then not a spectacular view down onto the mighty Mississippi river. It was about 75º and not a cloud in the sky. You just couldn’t ask for better riding weather. I rumbled into Hager City for an experiment. As I’d put less than 200 miles on the bike to date (and run out of gas once already), I didn’t yet have a good sense for what kind of range to expect from a tank of petrol. There’s no fuel gauge on the CB650 or even a sight glass — just a trip odometer and a reserve position for the petcock. The books say the gas tank will hold 3.7 gallons of gasoline, but just how far will that get me? I’d expected that the bike got somewhere between 30 and 60 mpg but that’s quite a range for prediction. Quick math at this particular tank of gas showed 37 mpg. Not bad. Not Vespa good, but not bad. That meant that on a bursting full tank of gas, I could expect not quite 140 miles of range. Put more pragmatically though, I’d better make 100 miles my fill up point of no return. I reset the trip odometer and headed out again onto the open road. My destination, if you could really call it that, was the Maiden Rock Cidery and Winery. All along the Great River Road there are wineries, pubs, diners, ice cream shops, museums and local flavor. The towns are spread out and for all their tourist treasure, none of the 50 miles or so of Hwy 35 that I’ve explored so far feels like a tourist trap. The sights feel much more Route 66 than Disneyland. 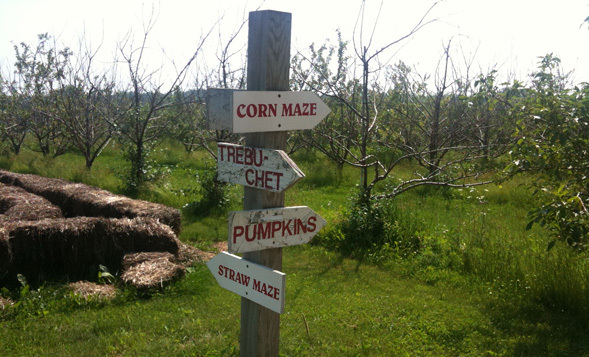 The Maiden Rock Cidery and Winery is a couple miles off the main road nestled into the kind of rolling farmland you’d expect to see painted on the side of a tub of butter. The vineyard and huge barn main building are the opposite of opulent. They’re nice, but they’re not trying very hard. I liked that. This was a place where time wasn’t a big deal — a place where there was no mobile phone service and they liked it that way. Maiden Rock makes a wonderful variety of hard ciders and apple wines as well as your expected Pinot Noir and other grape varieties. Beverage choices aside though, it’s a wonderful place off the beaten path to simply sit in the shade and do some reading. 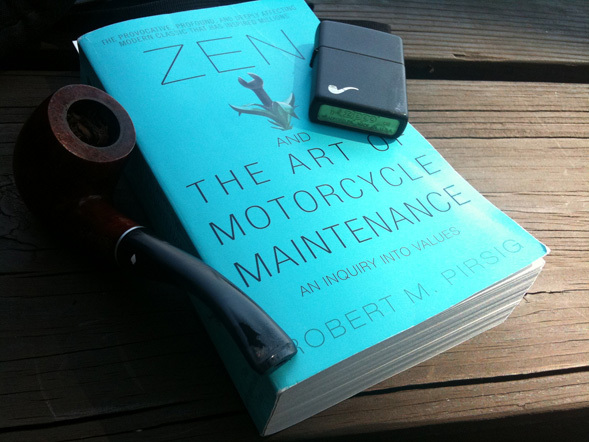 My book this year is Zen and the Art of Motorcycle Maintenance. 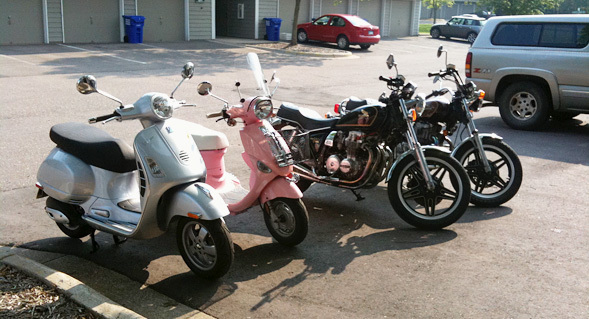 It’s the story of man who sets off on a motorcycle trip from the Twin Cities. Fitting, no? My day’s aspiration was to find someplace quiet and scenic, smoke my pipe, and read a chapter of Zen before heading back to the cities. Signage at Maiden Rock insists that you “please smoke in your car” so I set off in search of a better place of quiet solitude. Luckily, this Pipen Lake area of the Mississippi is littered with scenic overlooks. Within 10 minutes, I’d found a perfect, shady little picnic table overlooking the mighty river some hundreds of feet below. Where I sat is essentially where the glacier stopped so many eons ago. Looking west across into Minnesota, I could see the beginnings of the great plains below this mountainous perch. A lovely view indeed. Half way through my chapter of Zen, I heard what sounded like a large airplane headed my way from the south. It loomed loud and rumbly in the distance and I thought that any moment I’d see a DC-3 or B-17 go rumbling by at eye level, following the river. The noise grew and grew to epic anticipation. I searched the skies as the groan approached, larger and larger, faster and faster, until finally the sound was upon me. The doppler shift came and passed but the sound was still huge and ominous. I still couldn’t see anything. There was no plane. Was there some massive boat below? What the hell? As the noise continued to rumble the countryside, not knowing its origin was more disconcerting by the second. It sounded like whatever it was, it would crash into that very spot at any moment. I walked the ten yards forward to the chain link fence that rowed in the overlook. I wanted to peer over the cliff and try to glimpse the ghost ocean liner that surely must be haunting the water below. I peered over the fence and then face palmed myself. It was a freight train. About 25 feet in front of, and 25 feet below where I was standing was a line of railroad tracks that ran along the river cliffs. Empty coal cars sped by at what had to be close to 70 mph. I could just see the tops of them. Feeling hilariously foolish, I returned to my table, my book, and my pipe. I took up pipe smoking about a year ago when I fell in love with the pipe as an object. I’ve started carving a few and there are a couple different pipe rack designs in my project queue. Actually smoking one is something that I almost never do, but a day of such riding leisure all but demanded a bowl of smoke. As I read and puffed away, a man and woman in their late 50s arrived on a big Harley touring bike. The whole Great River Road is crawling with motorcycles. They’re at least 50% of the traffic and that’s one of the best parts of riding the road. The two of them walked up to the overlook and swooned at the view of Pipen Lake. His cell phone rang and I couldn’t help but overhear his conversation. Apparently he’d just been laid off that week down in Florida and came to Wisconsin to visit his lady friend. This was his escape from his newfound unemployment. There was something so sad, but so resiliently hopeful in how he talked about it. I’ve been there. It’s not fun, but it’s also strangely freeing. Unencumbered by steady income or regular office hours, it feels like life could take you anywhere — to both fortune and peril. It’s scary. It’s depressing. It’s exciting. It’s the kind of fun you hope not to have too often but it can be downright enjoyable for a little while, before the panic sets in. Other visitors came and went to the overlook over the hour I was there. Most never got out of their cars or off their motorcycles. I couldn’t help but wonder if they’d wanted the overlook to themselves — that if I hadn’t been there they would have gotten out and walked around. Why do we do that? Why are we so passive about sharing space with strangers? I do it too, and seeing these folk do it made me re-examine that motivation in myself. I wanted to get home in time to make epic sandwiches for myself and The Mrs, so it was time to go. I packed up my book and tapped out my pipe and fired the bike back up. I’d done the trip there in four stops, now it was time to ride back straight. More than anything, I wanted to know if I could stay comfortable on the bike for the 90 minute trip back to the TC. For the whole day, what I’d been so happy to discover was how my outlook on road progress was so much different on the motorcycle. What I mean by that is that for the first time I can remember, I drove at or below the speed limit. I didn’t care when I got where I was going. I didn’t care if I got where I was going. What mattered was the journey. The joy was in this piece of road — just that bit of tarmac between me and the horizon. That’s all I needed. I didn’t have any back pain. I didn’t have any discomfort in my hands or wrists. In fact, with my new handlebars I’m able to rest my elbows on my knees and ride lounged forward. It was just me and my motorcycle at one on the blacktop. As I rode into the setting sun, I felt like I could just keep riding all day and night and not stop until I hit ocean. It was profound and deeply personal. This was mine in a way few things ever seem to be in life. As I got closer to home, I had a small, momentary argument with myself that I want to share. I wondered what time it was. I didn’t want my wife to have to wait on me too long for supper. I looked down at my controls and gauges and wondered where I could strap a watch or a clock. Then I caught myself. Don’t you dare. I thought. That’s completely contrary to the very nature of this machine. A clock on a motorcycle is an abomination. That series of thoughts completely encapsulated how I felt about the whole trip. This was something almost sacred — a worship of motion and machine — time had no business there.